The entire Lancia stand in Paris has been conceived as a backdrop for the star of the show, the Delta. Visitors to the Paris Motor Show two years ago could have admired a concept car version of the same model. 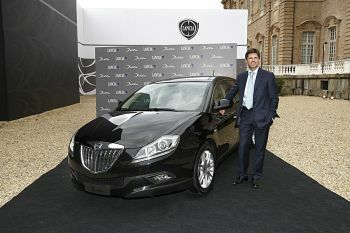 Photo: Lancia CEO Olivier François with the Delta. 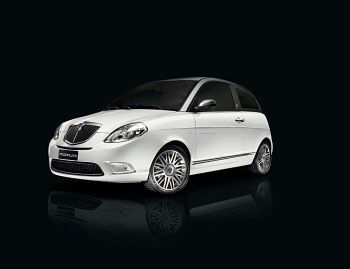 The Ypsilon Moda Milano on show in Paris will be equipped with a 75 bhp 1.3 Multijet engine and feature a two-tone body (Raffaello white and opaque Borromini grey) with interior trim in black Starlite leather and Alcantara. The equipment includes: fog light, automatic climate control system, particulate filter (DPF), two-tone 16'' alloy rims, Blue&MeTM and parking sensor. 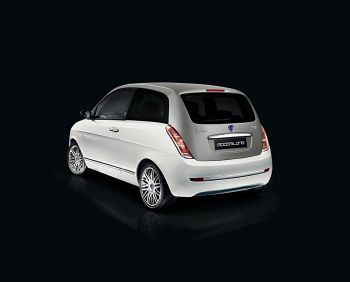 After the Delta and the Ypsilon Versus, the third and final focus of the Lancia stand is the Musa ‘Poltrona Frau’, the new top-of-the-range version of the City Limousine – the biggest selling MPV in Italy for nearly two years. The Lancia stand at this year’s Paris Motor Show represents a departure from previous motor shows as it is decorated in the style of a haut couture shop, though it still retains the main distinctive traits of the Lancia brand experience. The entire stand has been conceived as a backdrop for the star of the show, the Delta. Visitors to the Paris Motor Show two years ago could have admired a concept car version of the same model. In particular, a daring structure has been created to allow visitors to admire four of the cars in every detail and to appreciate the range of colours and different versions by standing them on their ends and turning them about their vertical axes. All this is accompanied by a view of the new 190 bhp 1.9 Twinturbo, displayed in a glass case as an example of the brand’s technological innovation. Visitors will also be able to discover the new Lancia merchandising range at the Lancia Boutique, a linear structure that is all black lacquered panels divided by steel panels, damask designs and perforated polished steel. The visitors area also sees the return of the Lancia Café, a traditional meeting point for a rendezvous or quick aperitif. The café has also become an institution outside the motor shows, with a temporary version at the last two editions of the Venice Film Festival that was routinely frequented by actors and show business personalities - and the opening of the first Lancia Lifestyle Lounge in Berlin this February (an innovative concept that combines the qualities of a lounge bar with those of a car exhibition space). Going back to the true stars of the stand, the centre of the exhibition area is occupied by a two-tone Lancia Delta (Full Moon Ivory and Lava Black) – the model that was recently awarded a coveted 5 star Euro NCAP rating – equipped with a 120 bhp 1.6 Multijet engine that is offered for the first time together with the Selectronic. This 6-speed robotised gearbox meets a growing demand for automatically-controlled gearboxes for great driving comfort, particularly over an urban cycle, while offering a further improvement over manual gearboxes in terms of fuel consumption and CO2 emissions. The car also offers burnished 17” alloy wheels, black interior trim, dual zone climate control system, sun-roof, Blue&Me NavTM, knee bags, rear parking sensor and a Techno Pack (rain and dusk sensors, electrochrome mirror and cruise control). The second Lancia Delta on show in Paris is a 165 bhp 2.0 Multijet in a Platino version with two-tone bodywork (Eclipse Black and Lava Black) equipped with a Techno Pack, 18” alloy rims, Instant Nav, Blue&MeTM, dual zone climate control system, knee bags, twin chrome exhaust tail-pipe and rear parking sensor. The other four Deltas are also attached vertically to two original revolving structures: the first bears a two-tone (Nadir Pearl and Lava Black) Platino version of the 165 bhp 2.0 Multijet and a two-tone (Sunset Bordeaux and Lava Black) 150 bhp 1.4 Platino equipped with a Techno Pack, 18” alloy rims, Instant Nav, Blue&MeTM, dual zone climate control system, knee bags, twin chrome exhaust tail-pipe and rear parking sensor. The same wealth of equipment can be seen on the two-tone (Wind Grey – Lava Black) 165 bhp Delta Platino 2.0 Multijet housed on the second structure. The last Delta exhibited at the Paris show revolves together with this car: a two-tone (Aqua Blue – Lava Black) 120 bhp 1.6 Multijet Oro version equipped with Blue&Me NavTM, Techno Pack, dual zone climate control system, knee bag, Granluce sun-roof and rear parking sensor. The second focus of the stand is a Lancia Ypsilon VERSUS show car produced with the Versace Group brand that will also dress the models on the stand with garments chosen to suit the expressive motifs of the exhibition space. All this confirms the strong bond between Lancia and the world of Fashion. Together with Design and Cinema, Fashion is one of the brand's languages of reference, as is borne out by the choice of Lancia cars as official vehicles for the Milan fashion week. 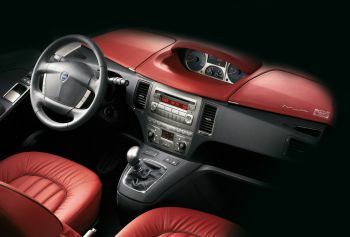 The car on show is fitted with the sparkling 75 bhp 1.3 Multijet (with particulate filter) and is distinguished by a Bronzino Bronze body and interior upholstery in brown leather, plus certain important features: including Blue&MeTM, a dual zone automatic climate control system, fog light, 16" alloy rims with an original bronze chrome finish. 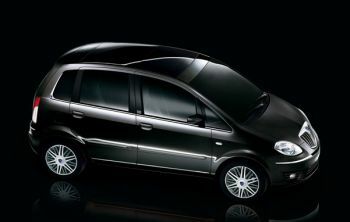 After the Delta and the Ypsilon Versus, the third and final focus of the Lancia stand is the Musa ‘Poltrona Frau’, the new top-of-the-range version of the City Limousine – the biggest selling MPV in Italy for nearly two years. 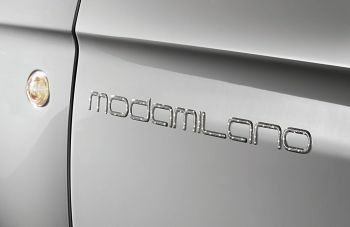 This version combines two quintessential Italian designer names, i.e. 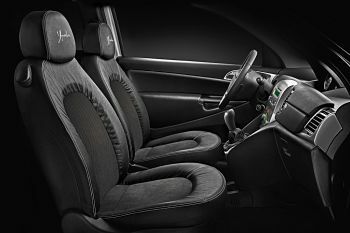 the design styling, attention to detail and crafted two-tone paint finish typical of Lancia cars coupled with the exclusivity and sophistication of leather and the craftsmanship of Poltrona Frau. Visitors to the Paris show can admire two examples of this exclusive version alongside three prestigious red Poltrona Frau cars (Vanity model): a two-tone (Alabaster White and black) 90 bhp Platino 1.3 Multijet with red interior trim and a black 120 bhp Platino 1.6 Multijet with natural leather interiors. It should be remembered that the Lancia Delta, Ypsilon and Musa are all produced by FPT – Fiat Powertrain Technologies, a Fiat Group company that specialises in the development and production of power units and gearboxes.